Precision utilizes both Ground Penetrating Radar and Electromagnetic induction technology to locate subsurface utilities, objects and anomalies. Prior to digging and trenching, contractors, engineers, environmentalists, home owners and home inspectors can turn to Precision Radar Scanning for non-destructive detection of subsurface utilities. Precision Radar Scanning can accurately locate and map underground facilities of metallic and non-metallic pipes. As-builts and BC One Call documents can be out dated and inaccurate. Precision can eliminate the risks and hazards involved in a ground disturbance by locating these subsurface utilities in real time. 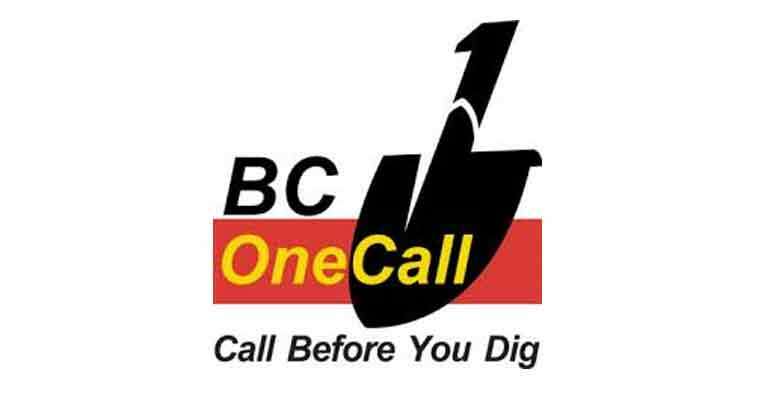 To ensure proper ground disturbance protocol is followed, Precision can assist our clients in placing a BC One Call request as well as notifying local municipalities, regional districts and utility companies whose buried utilities are not registered under the BC One Call program. 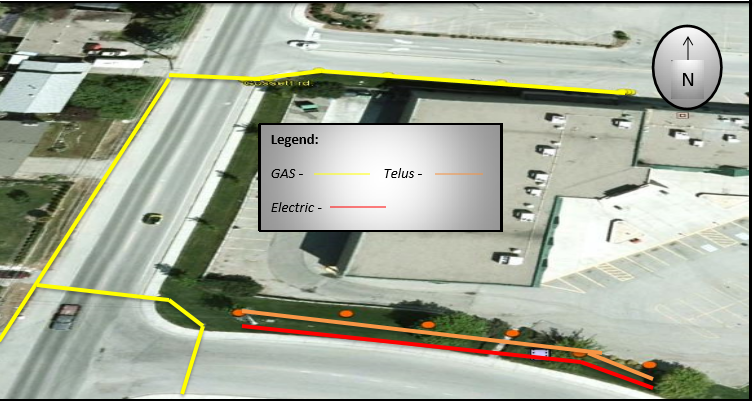 We will provide accurate locations on site with the universal colour codes and approximate depths, of gas, electric, telecommunications, water, and sewer facilities. 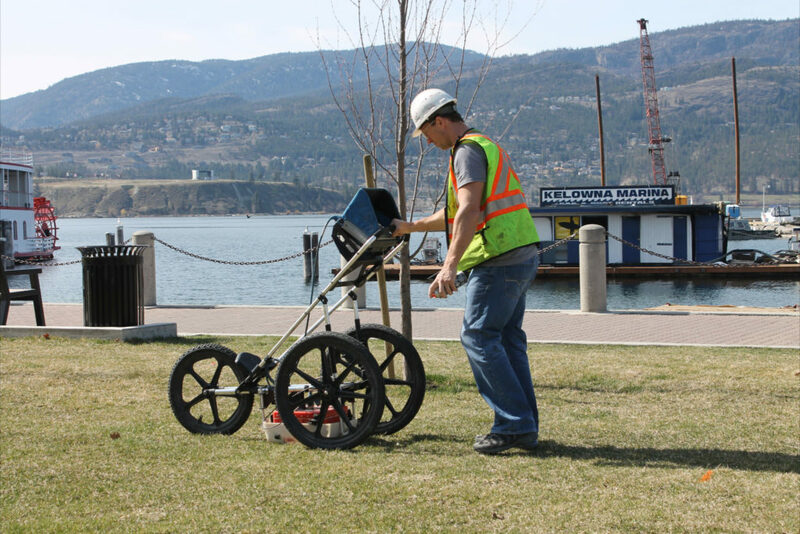 Precision Radar Scanning provides subsurface utility locate service across the Okanagan, Thompson, and Kootenay regions. We locate underground utilities for industrial, commercial and residential settings. Our certified field technicians use the latest Electromagnetic Technologies (EM), and apply a variety of EM methods to precisely locate underground facilities, which include: active/conductive, inductive, inductive sweeps and passive methods. Locates performed at the National Research Council in White Lake BC. A combination of GPR and EM locates were performed to accurately locate of subsurface facilities. All utilities are marked with the B.C. regulatory colours and the client is provided a buried structures sketch for documentation. GPS coordinates and Satellite imagery maps of buried utilities can be provided upon request. Upon request, satellite imagery maps can be produced and sent to the customer. These maps enhance customers knowledge and overview of the locates performed. These maps are considerably easier to reference and interpret than the gray scale hand sketches provided in the past. 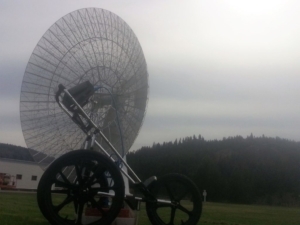 At Precision Radar Scanning, our technicians can apply Ground Penetrating Radar (GPR) in instances where an Electromagnetic signal cannot be induced on a facility. GPR can be very effective in locating non-metallic PVC pipes, water lines, sewer and sanitary lines, irrigation, underground fuel and oil tanks and septic tanks. GPR can also assist in locating a utility where the tracer wire is broken or absent. Please refer to our Underground Tank Locating page for more information on how GPR is used to locate underground fuel storage tanks. To ensure proper ground disturbance protocol is followed, Precision can assist our clients in placing a BC One Call request, as well as notifying local municipalities, regional districts and utility companies whose buried utilities are not registered under the BC One Call program. All utilities are marked with the B.C. regulatory colors and the client is provided a buried structures sketch for documentation. 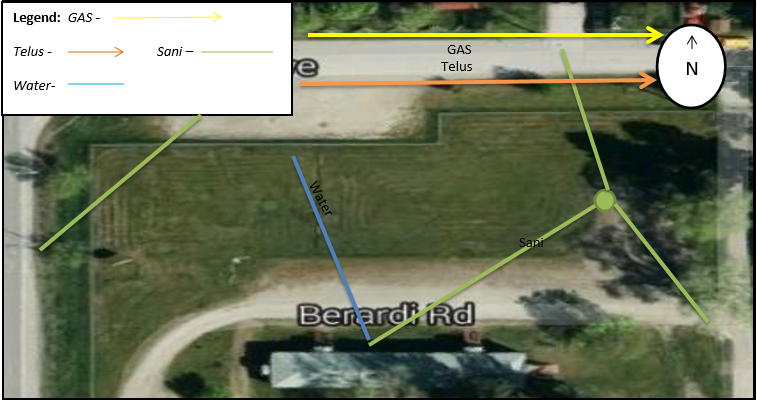 GPS coordinates and Satellite imagery maps of buried utilities can be provided upon request.